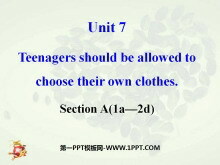 《Teenagers should be allowed to choose their own clothes》PPT课件19 Presentation 1a Read the questions. How often do you do these things? Write A (for always ) U (for usually) S (for sometimes) and N (for neve..
《Teenagers should be allowed to choose their own clothes》PPT课件18 课本要点点拨 keep off 关闭; 阻挡 【语境领悟】 *Mobile phones should be kept off during the meeting. 在开会期间手机应该关闭。 *The old umbrell..
《Teenagers should be allowed to choose their own clothes》PPT课件17 Ⅰ. 单词拼写 1. support(v. n. )__________________ 2. enter(v. )__________________ 3. choose(v. )__________ (n. )选择 挑选 答案: 1. 支持 2. 进..
《Teenagers should be allowed to choose their own clothes》PPT课件15 Lead in Do you have any rules at home? Do you have any rules at school？ Do your parents allow you to do the following things? Obey the famil..
《Teenagers should be allowed to choose their own clothes》PPT课件13 新知预测 Ⅰ. 单词拼写 1. 证件(n. )__________ 2. 冒烟; 吸烟; 烟(v. n. )__________ 3. 兼职的(adj. adv. ) __________ 4. 扎; 刺破; 穿透(v. ) ____..
《Teenagers should be allowed to choose their own clothes》PPT课件12 Lead-in Discuss Do you have any rules at home? Do you have any rules at school ？ Do your parents allow you to do the following things? Fast-..
《Teenagers should be allowed to choose their own clothes》PPT课件11 Parents dont allow teenagers to drive. Teenagers arent allowed to drive. Teenagers shouldnt be allowed to drive. Do you have any rules at hom..
《Teenagers should be allowed to choose their own clothes》PPT课件10 Match the words in the two columns and choose five phrases to make sentences. It is not allowed to take photos here. I want to do part-time j..
《Teenagers should be allowed to choose their own clothes》PPT课件9 Review Talk with your classmates about your school rules by using students are not allowed to. 一般现在时的被动语态 在英语中，动词有两种语态，..
《Teenagers should be allowed to choose their own clothes》PPT课件8 Read the questions. How often do you do these things? Write A for always U for usually S for sometimes and N for never. Then talk with a partn..